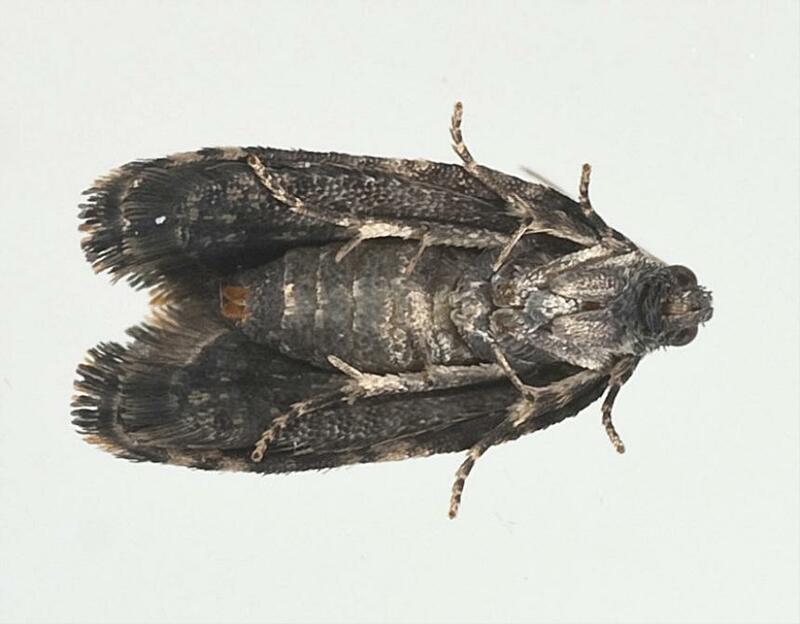 This endemic moth is found throughout the North Island and in northern South Island where its endemic host plant, leather-leaf fern, Pyrrosia eleagnifoliai , occurs. 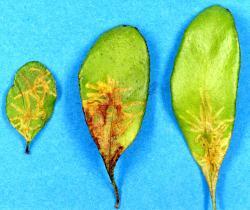 It makes its distinctive mines in plants in cities and native ecosystems. 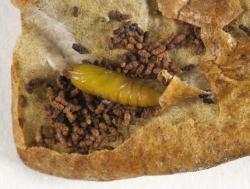 Large caterpillars and pupae were found in spring. In captivity, moths emerge in September, but in the wild, mostly in October. Moths may also be found in November and December. 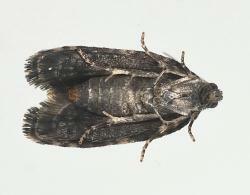 Adult moths are about 10mm long. 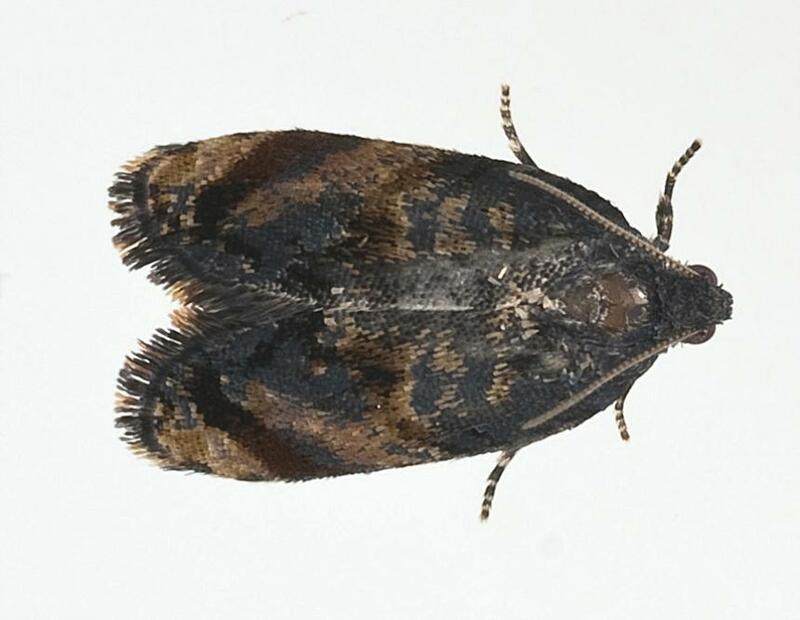 Female moths are leaden-coloured on the head and thorax; the forewings are light brown centrally and shaded reddish brown towards the wing tip. There is a red streak near the wing tip, while the wing base has leaden mottling along the front edge and in the hind corner. 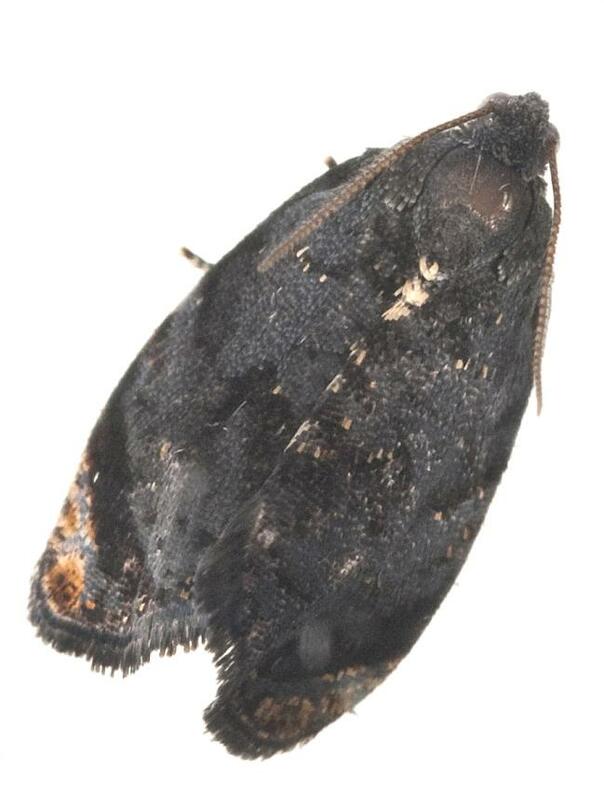 In the male moth leaden colour obscures the brown centre of the wings (see photo). The moth holds its wings roof-like over its body. It flies like a rocket. When disturbed they run about with frequent brief stops. Eggs are assumed to be laid on fronds of its host plant. 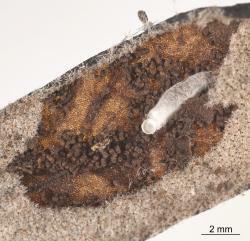 The caterpillars hatching from eggs probably tunnel directly into the frond forming narrow mines visible from the upper side of the frond. The young caterpillar makes a series of mines radiating out from a base. 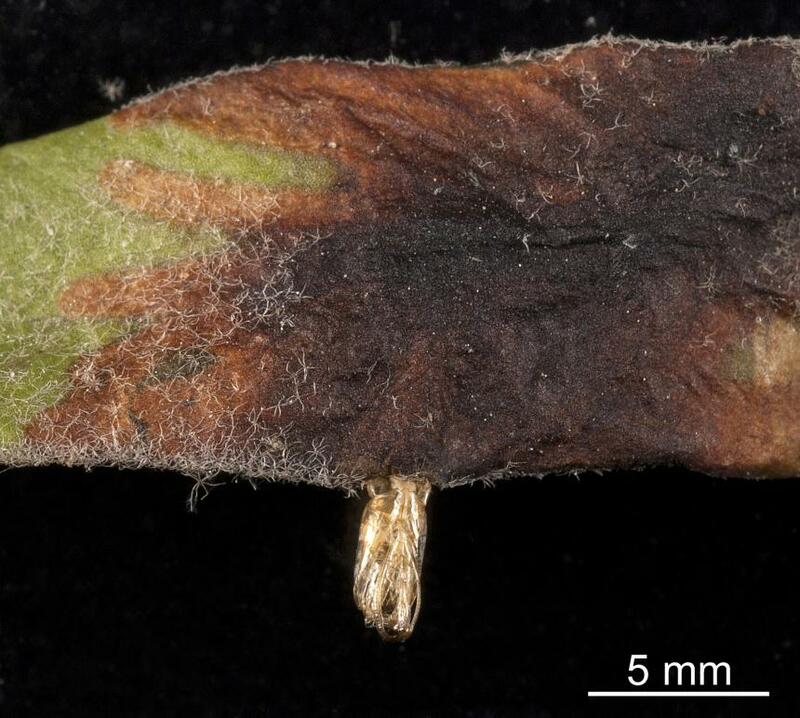 The caterpillar may move to another frond and make more mines. The caterpillar may leave a frond through either the upper or lower surface, but always enters a frond through the lower surface. Prior to burrowing into a frond it may spin a silken canopy to protect itself. 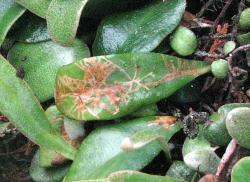 The large caterpillar makes a larger blotch mine. This may appear as a darker area in the frond. As the caterpillar grows it moults (changes skin). When fully grown the caterpillar is about 12-14 mm long. 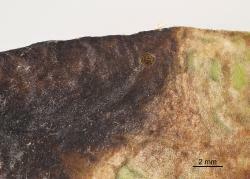 The skin is covered with short fine hairs except in the area of tubercles (small raised areas on the upperside of body segments). If disturbed, the caterpillar will exude a black fluid through its mouth. 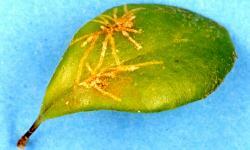 Mines are filled with frass (insect faeces). When the caterpillar is fully grown, it makes a thin silk lined chamber in the blotch mine and amongst the frass. At the head end of the cocoon the caterpillar makes a narrow slit in the frond through which the moth will exit. The caterpillar moults into a pupa that has rows of small black spines that assist the pupa to wriggle out of the cocoon and fern frond by preventing the pupa from moving backwards. 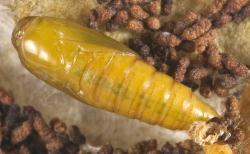 After about four weeks when the moth has developed inside the pupa, the pupa wriggles forwards, out through the cocoon and the fern frond. The moth then emerges from the pupa. 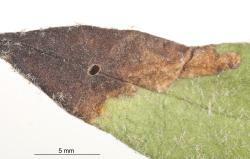 Adult leather-leaf star-miner, Philocryptica polypodii, (Lepidoptera: Tortricidae), upper side of moth. Adult leather-leaf star-miner, Philocryptica polypodii, (Lepidoptera: Tortricidae), underside of moth. 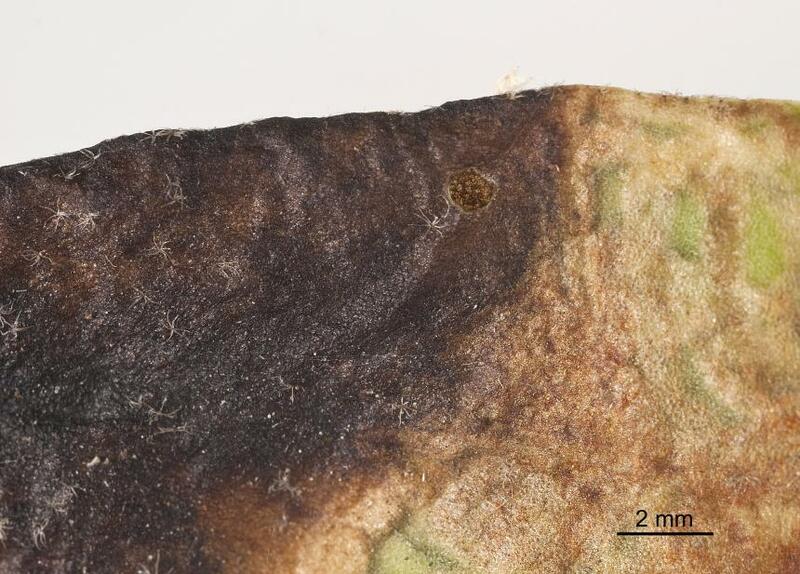 Empty pupal case of the leather-leaf star-miner, Philocryptica polypodii, (Lepidoptera: Tortricidae), protruding through the side of a frond of leather-leaf fern, Pyrrosia eleagnifoliai. When the moth is ready to emerge from the pupa, the pupa pushes through a slit in the wall of the mine and then emerges. 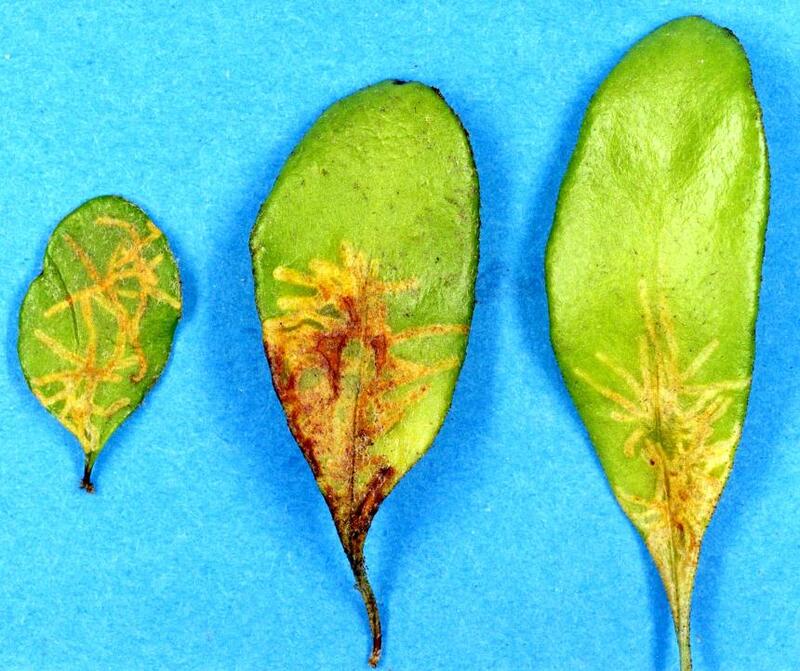 Moths of this leafminer are similar in appearance to the filmy-fern leaf tiers ‘Tortrix’ fervida (Meyrick, 1901) and ‘Tortrix’ sphenias (Meyrick, 1909) (Tortricidae), but these moths lack the leaden forewing scales and have a reddish thorax. Caterpillars of several kinds of moths make mines in leather-leaf fern, but only leather-leaf star-miner, Philocryptica polypodii, makes the star-like pattern of radiating mines. Hence the presence of the moth can be recognised by the presence of the mines. 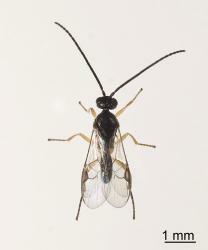 Larvae of the wasp, Dolichogenidea sp. 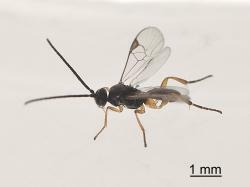 (Hymenoptera: Braconidae) have been found in mines. 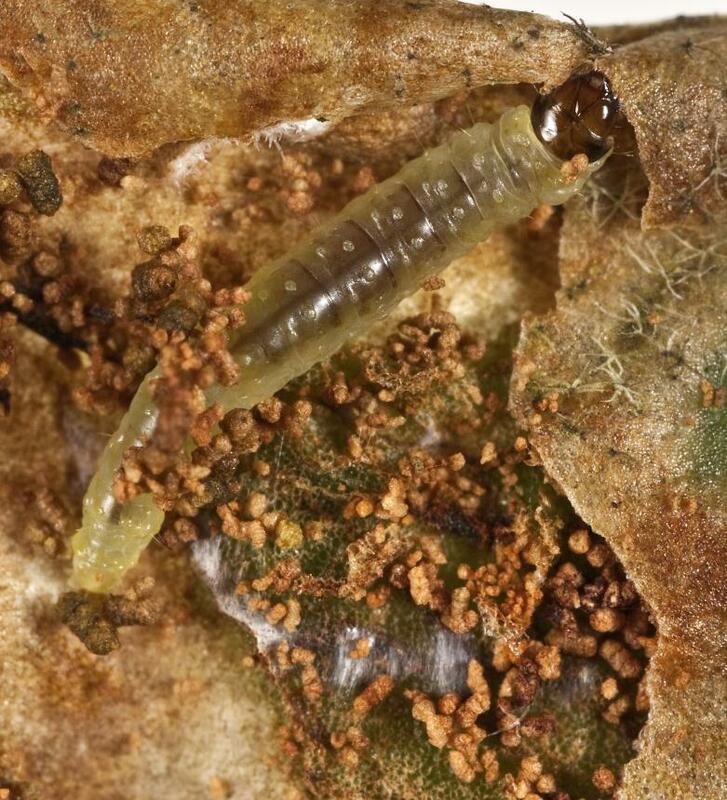 The mature wasp larva spins a silk cocoon in the mine. After the adult wasp has emerged from the pupa and hardened its cuticle, it pushes open the lid of the cocoon and chews a round exit hole in the wall of the mine. 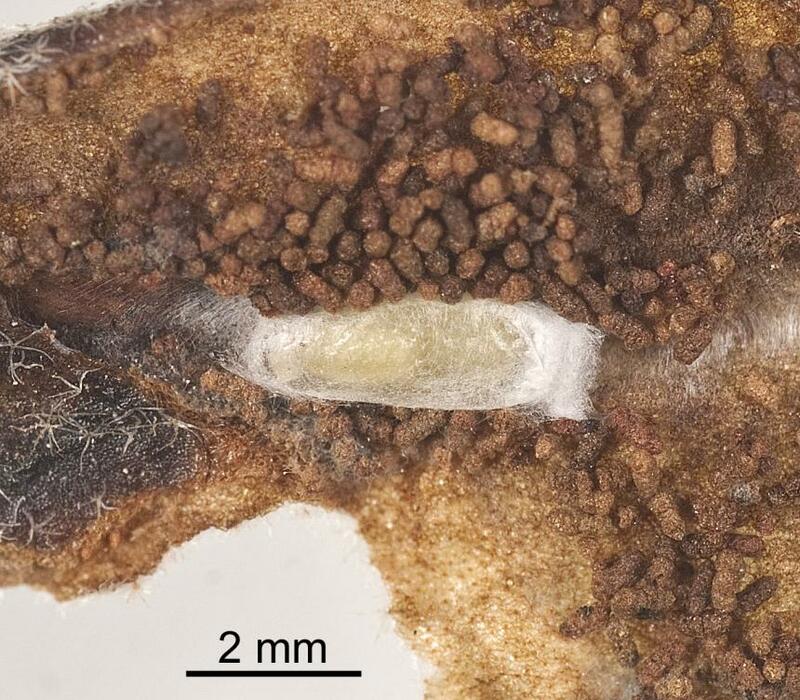 Cocoon of wasp parasitoid, Dolichogenidea sp. 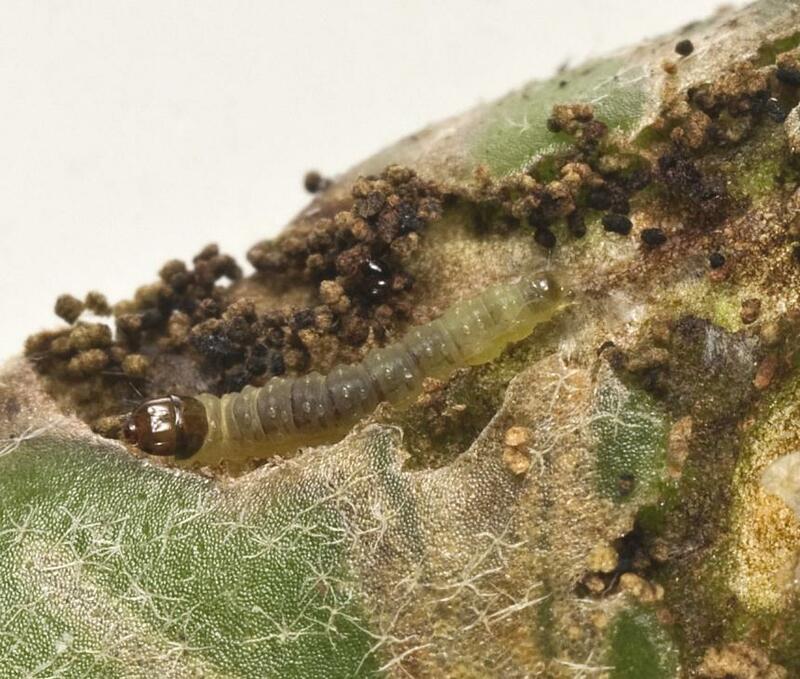 (Hymenoptera: Braconidae), of larvae of the leather-leaf star-miner, Philocryptica polypodii, (Lepidoptera: Tortricidae), in a frond of leather-leaf fern, Pyrrosia eleagnifoliai; a pale pupa is in the cocoon. 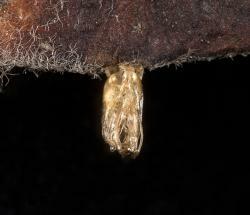 Empty cocoon of wasp parasitoid, Dolichogenidea sp. (Hymenoptera: Braconidae), of larvae of the leather-leaf star-miner, Philocryptica polypodii, (Lepidoptera: Tortricidae), in a frond of leather-leaf fern, Pyrrosia eleagnifoliai; note the lid (right side) partly pushed off exposing the exit hole. Empty cocoon of wasp parasitoid, Dolichogenidea sp. 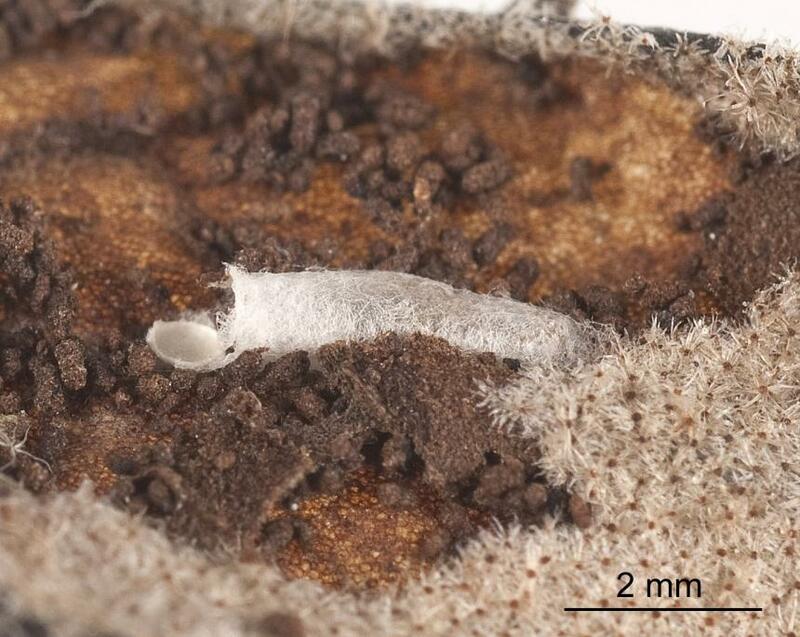 (Hymenoptera: Braconidae), of larvae of the leather-leaf star-miner, Philocryptica polypodii, (Lepidoptera: Tortricidae), in a frond of leather-leaf fern, Pyrrosia eleagnifoliai; note the lid (left side) partly pushed off. 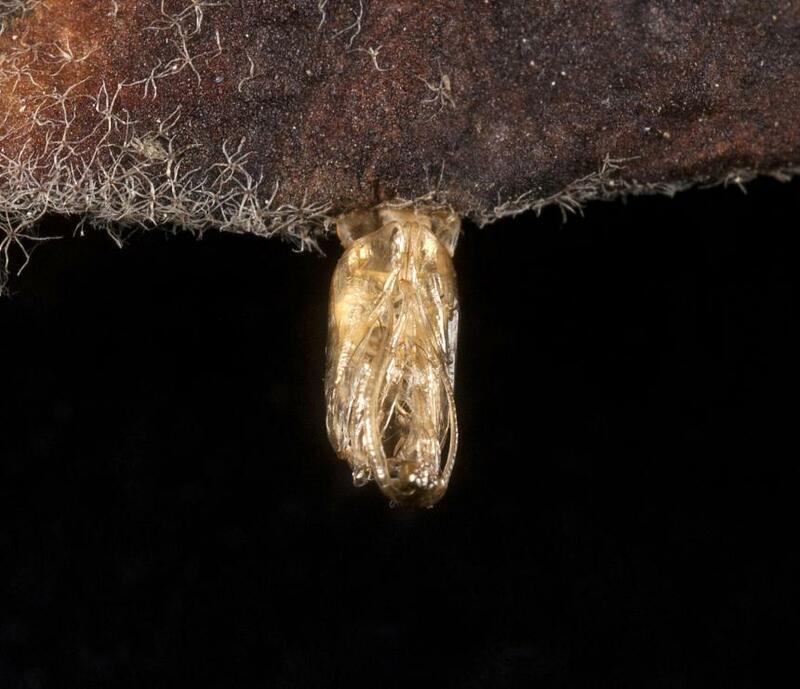 Empty cocoon of wasp parasitoid, Dolichogenidea sp. 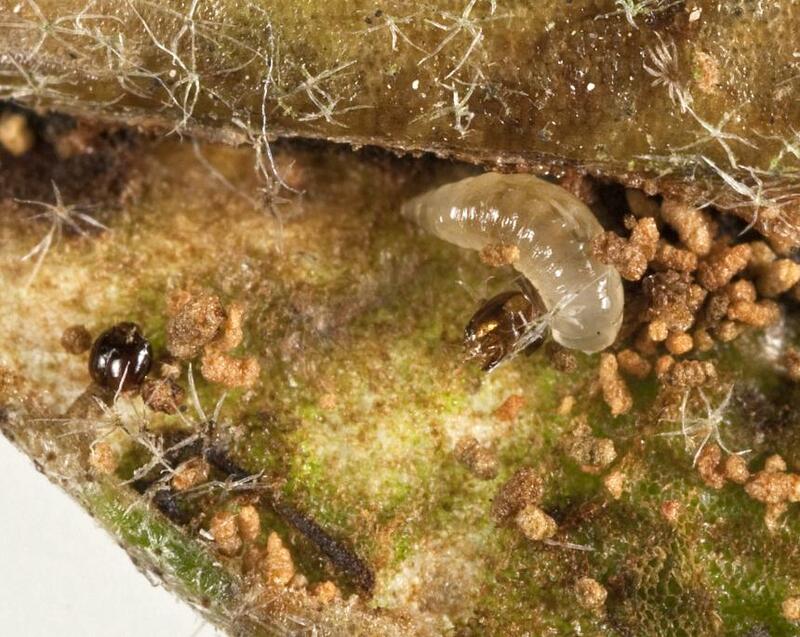 (Hymenoptera: Braconidae), of larvae of the leather-leaf star-miner, Philocryptica polypodii, (Lepidoptera: Tortricidae), in a frond of leather-leaf fern, Pyrrosia eleagnifoliai; note the lid (left side) pushed off. Exit hole of wasp parasitoid, Dolichogenidea sp. (Hymenoptera: Braconidae), of larvae of the leather-leaf star-miner, Philocryptica polypodii, (Lepidoptera: Tortricidae), in a frond of leather-leaf fern, Pyrrosia eleagnifoliai. Adult wasp parasitoid, Dolichogenidea sp. 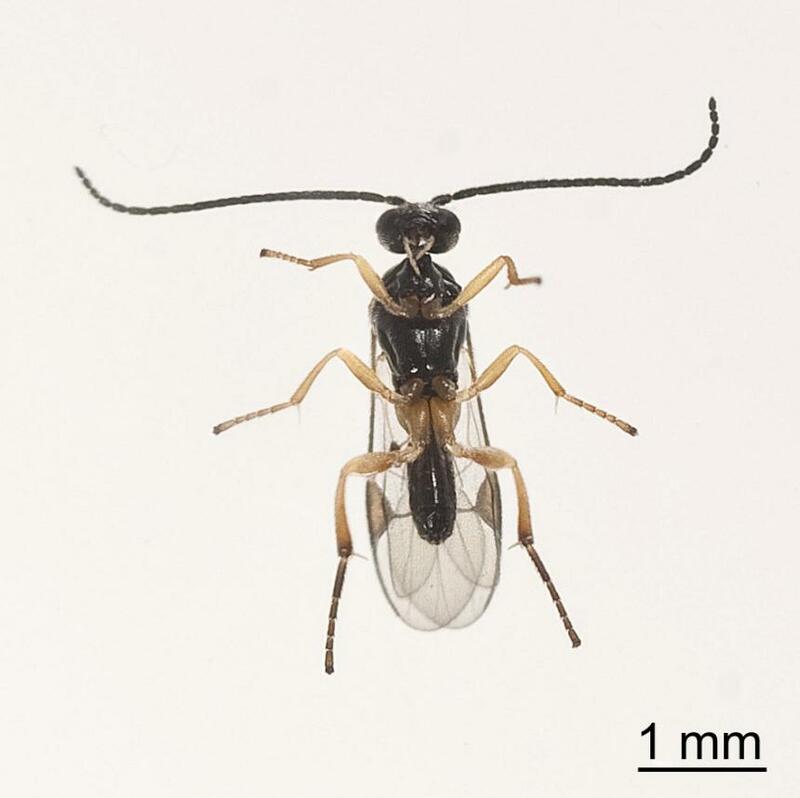 (Hymenoptera: Braconidae), of larvae of the leather-leaf star-miner, Philocryptica polypodii, (Lepidoptera: Tortricidae), top view. 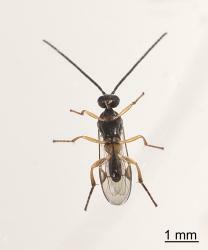 Adult wasp parasitoid, Dolichogenidea sp. 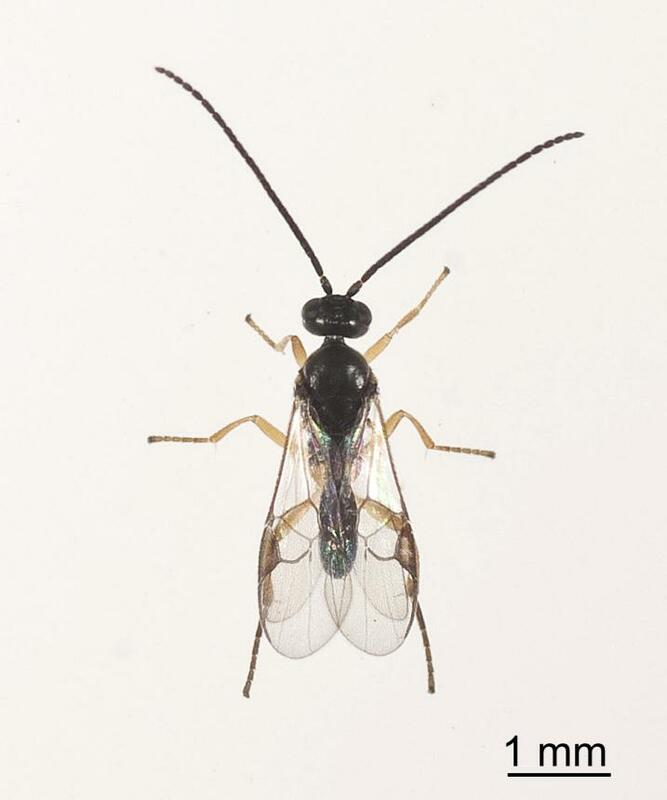 (Hymenoptera: Braconidae), of larvae of the leather-leaf star-miner, Philocryptica polypodii, (Lepidoptera: Tortricidae), underside. 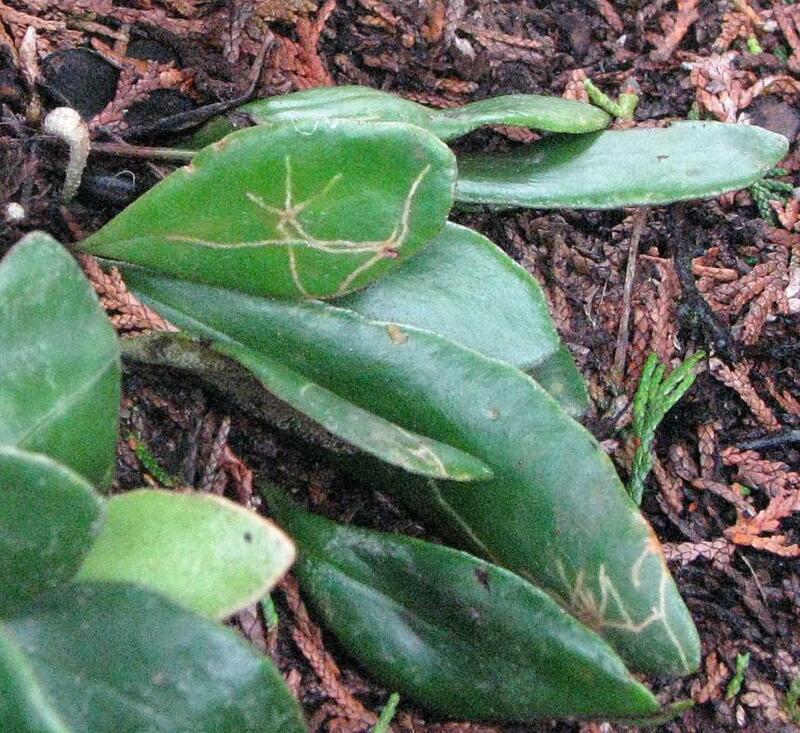 The leather-leaf star-miner, Philocryptica polypodii, has only one host plant, leather-leaf fern, Pyrrosia eleagnifolia (Bory) Hovenkamp (Polypodiaceae). 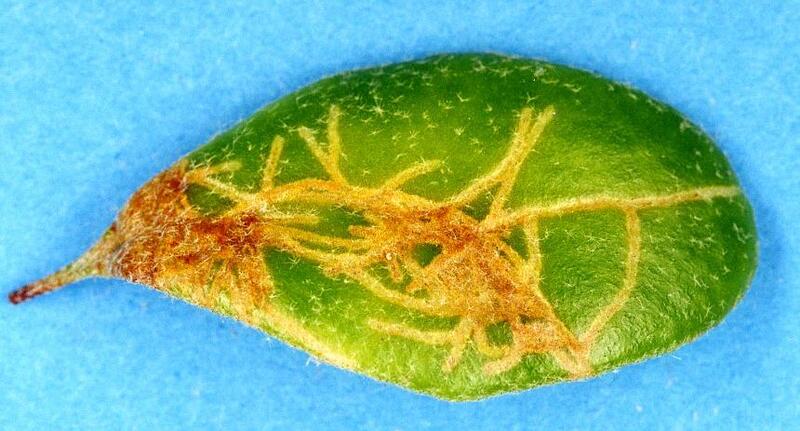 The caterpillars feed on the internal tissues of the fern frond. They tunnel through making mines that are visible from the upper side of the frond. The young caterpillar makes a series of mines radiating out from a base. 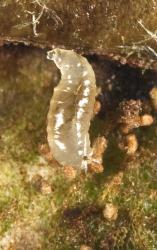 The caterpillar may move to another frond and make more mines. The large caterpillar makes a larger blotch mine. This may appear as a darker area in the frond. Watt MN 1924. 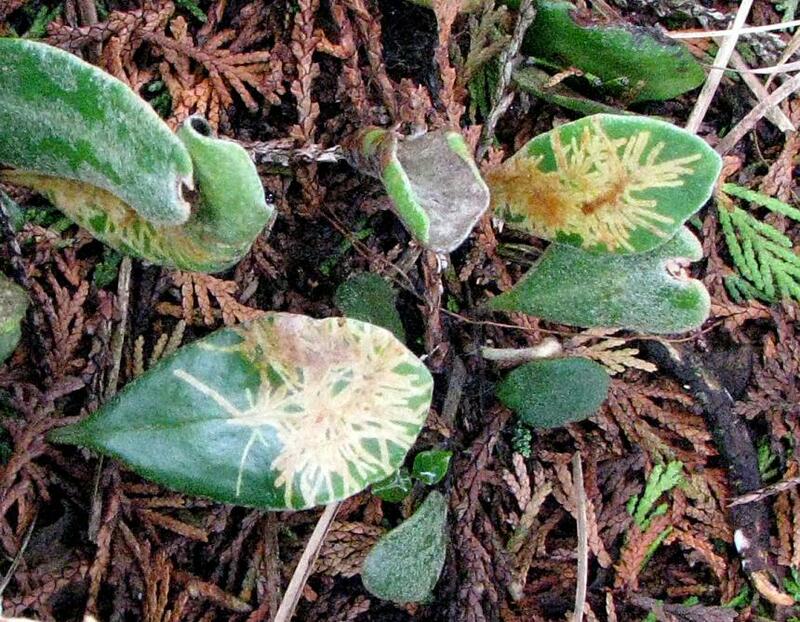 The leaf mining insects of New Zealand: Part 4 Charixena iridoxa Meyr., Apatetris melanombra Meyr., Philocryptica polypodii Watt (Lepidoptera). Transactions of the New Zealand Institute 55: 327-340. 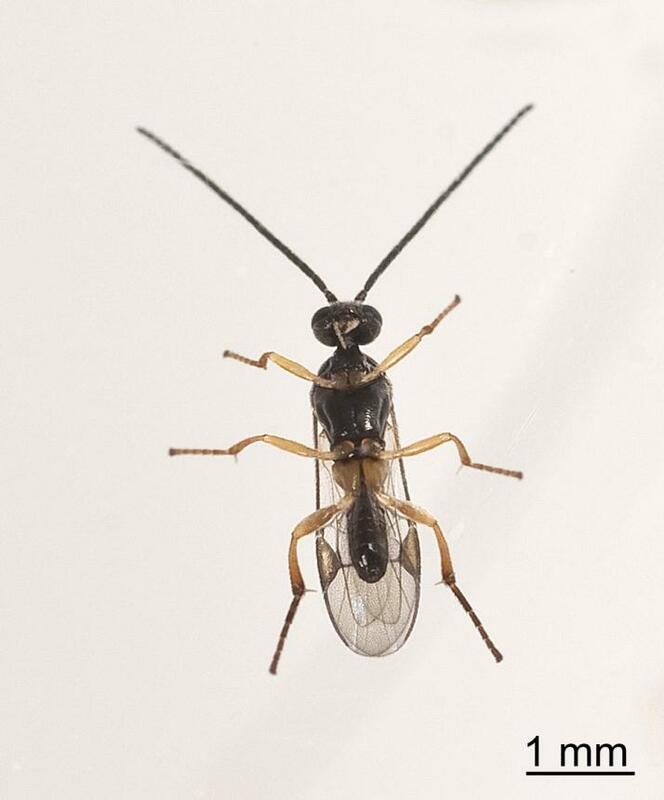 Adult wasp parasitoid, Dolichogenidea sp. 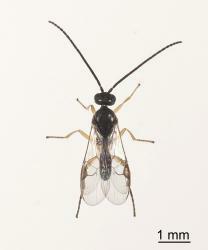 (Hymenoptera: Braconidae), of larvae of the leather-leaf star-miner, Philocryptica polypodii, (Lepidoptera: Tortricidae. 5 June 2015. NA Martin. 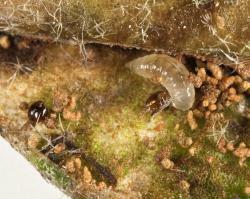 Life stages: photos of pupal case and moths added. Recognition: added photos. Natural enemies: parasitoids expanded, photos of cocoons, exit holes and adults added. Additional information: deleted. Additional images added. Martin NA. 2010, revised 2015. 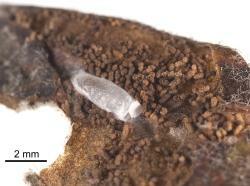 Leather-leaf star-miner - Philocryptica polypodii. Interesting Insects and other Invertebrates. New Zealand Arthropod Factsheet Series Number 15. http://nzacfactsheets.landcareresearch.co.nz/Index.html. Date Accessed. ISSN 1179-643X.